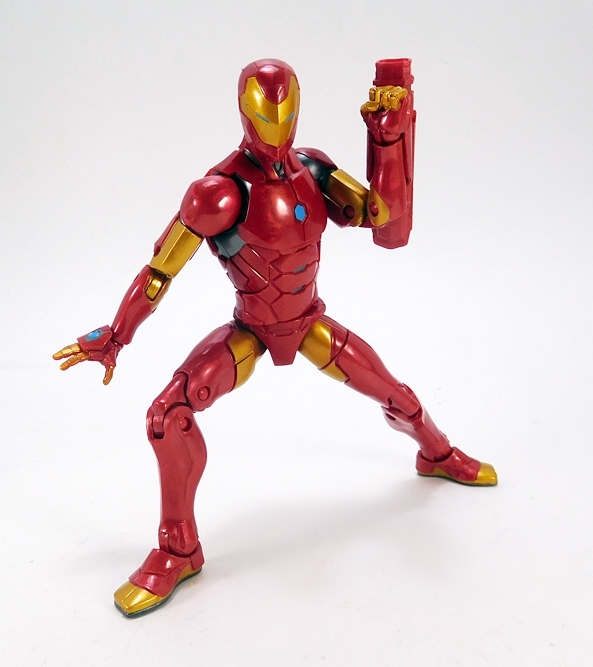 Here we go, folks, it’s the last packaged figure from the Marvel Legends Okoye Wave and it is… Iron Man!?! Oh, Hasbro! 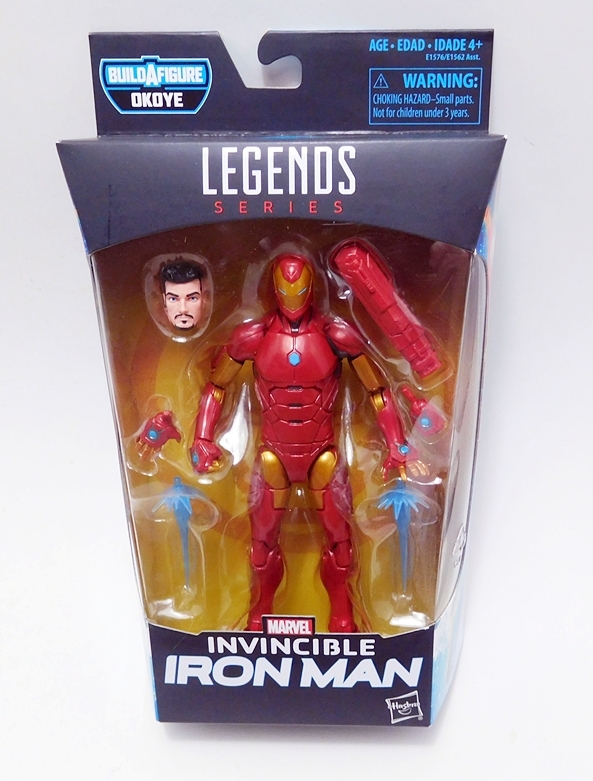 Well, I guess you’ve been so good about cutting back on your Iron Man releases, I’ll give this one a pass. And in fairness, Hasbro made it so you don’t have to buy this one in order to complete the Okoye BAF, but even so, I couldn’t resist picking this one up when I saw it on the peg. There’s just so much cool extra stuff in the package! 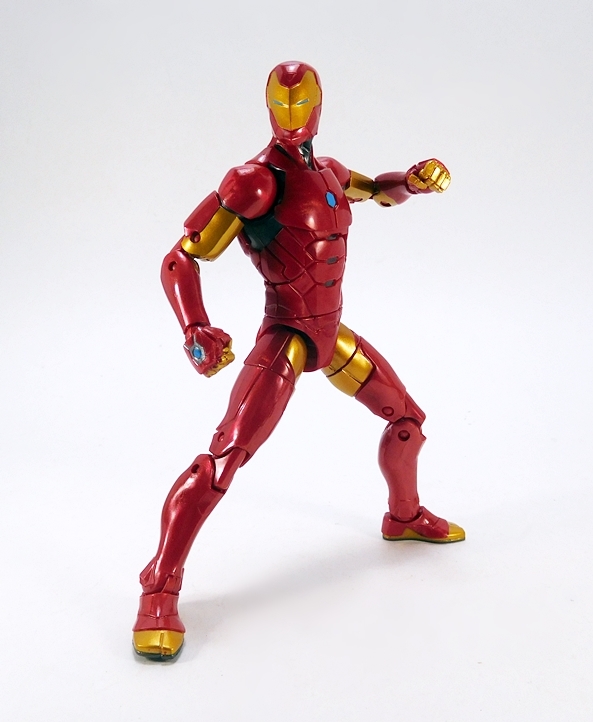 I believe this is Tony’s armor from a recent run of the “All New, All Different” Avengers, or something like that. As most of you know I’ve been on a sabbatical from Marvel’s current books until they get their collective comic book house in order. 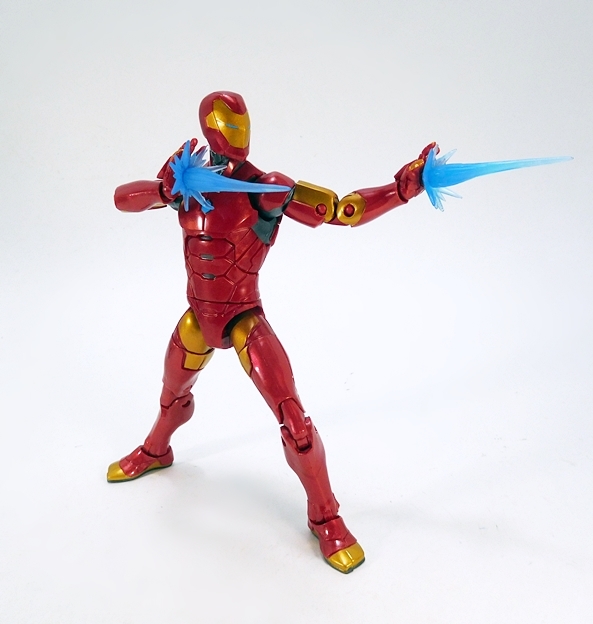 But hey, I don’t need context to appreciate another variant of the Iron Man armor, especially when it’s a comic-based one. So, let’s get him open and see what he’s all about! 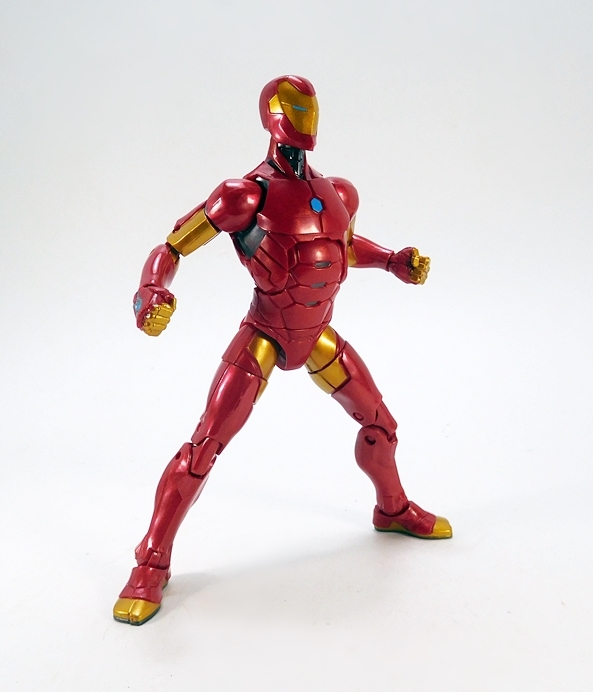 In the comics, it seems like the more advanced Tony’s armor gets, the simpler it looks. That’s definitely the case here and I really dig that. 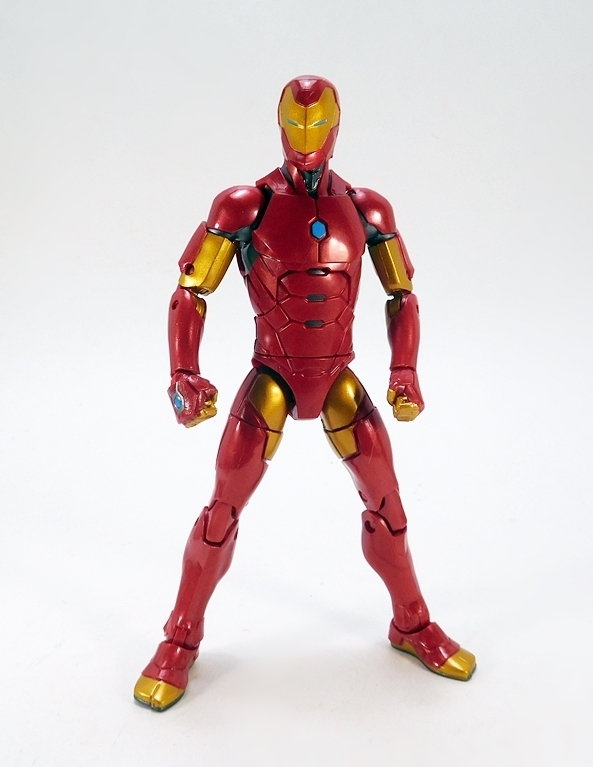 From memory, this suit reminded me a whole lot of the Extremis Armor figure we got way back in the Terrax Wave. When I put them side by side, it’s maybe not quite that striking, but there are similarities. 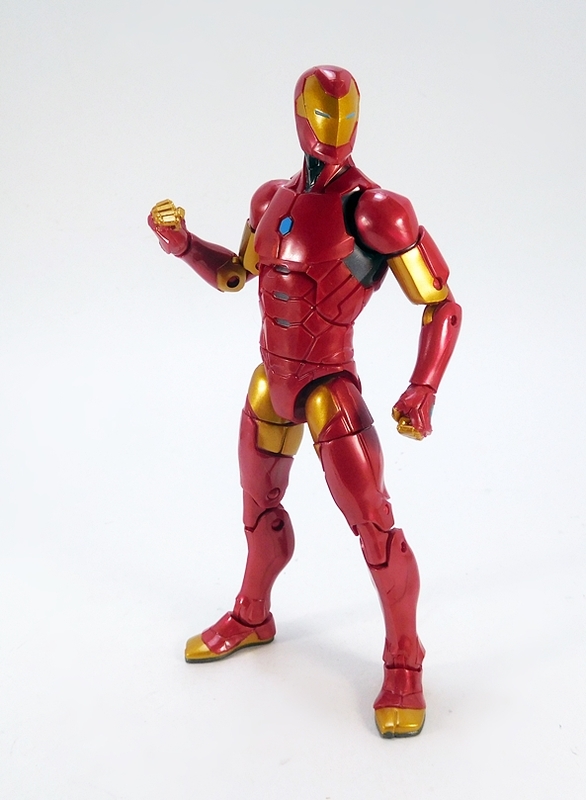 The limbs here are a little bulkier, the torso less stylized, and he doesn’t have the shoulder armor. 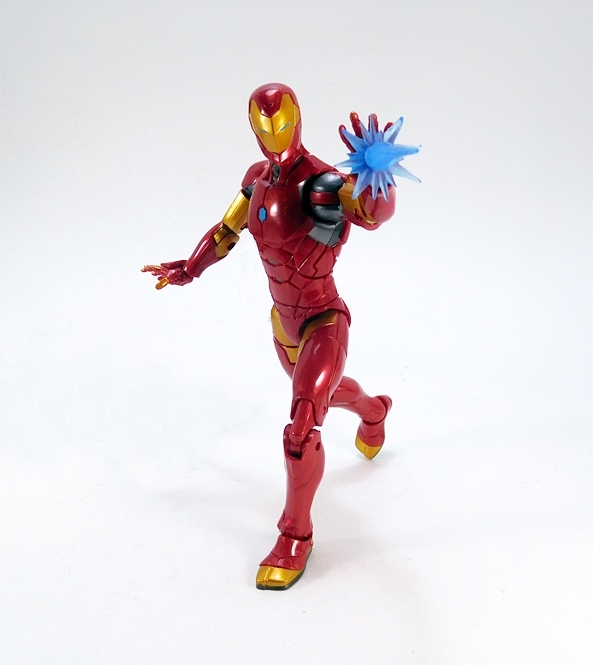 I like the economy of panel lining, as most of it resides in his abs, and the crystal-style Arc Reactor is pretty cool. He also has a cool looking spine sculpted into his back. The coloring here is predominantly red plastic. There’s a little of that swirly effect in it, but not too much. 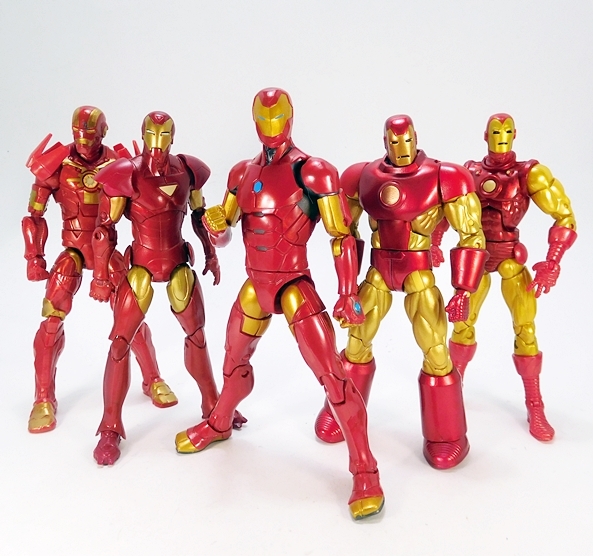 Indeed all the red here has a nice, bright new car luster that makes for a snappy looking figure. 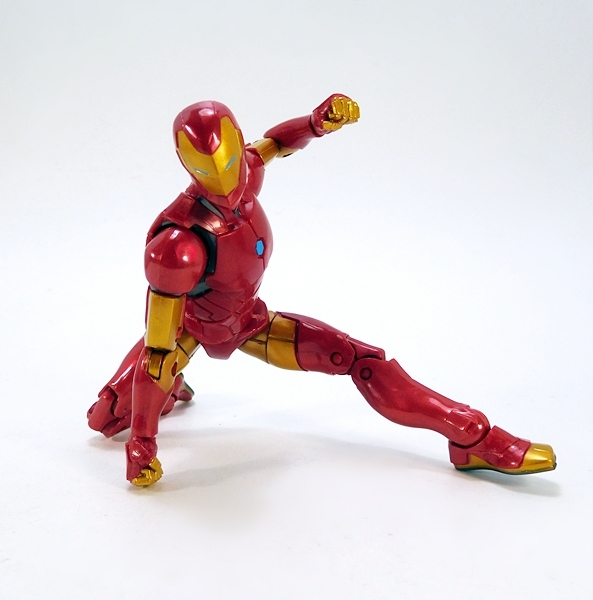 Gold paint is used sparingly on the toes, inside of the thighs, the biceps, and the fingers. You even get a bit of matte gray under-suit showing around the neck and under the arms. 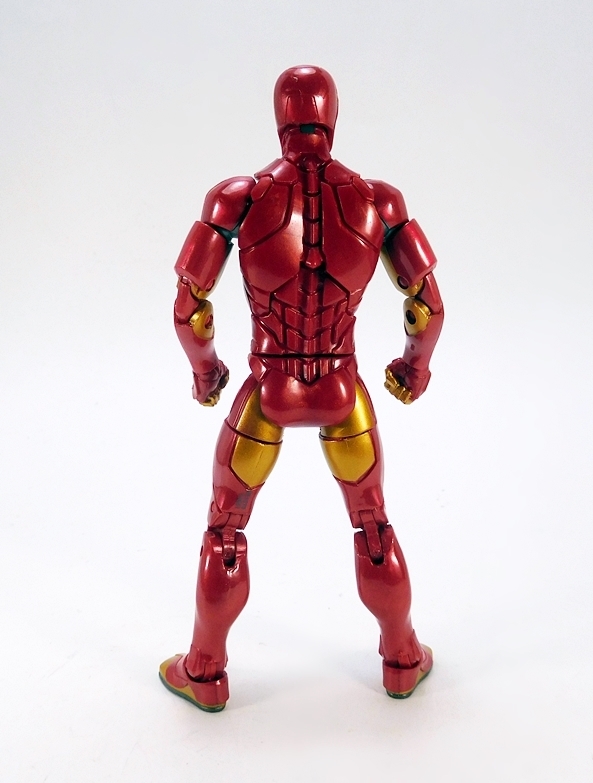 Also, you may note that the pegs in the elbows aren’t painted to match the gold areas. This bugs the hell out of some people, and I get that, but it doesn’t really bother me at all. There are no repulsors sculpted into the bottom of the feet, but for all I know that’s part of the armor design and not an oversight. I’m a little iffy on the design of the helmet. The eyes have evolved into almost non-existent slits and the face plate has a sharp angle running down the center. It’s certainly different, and I’m thinking it might grow on me the more I mess around with him. I do like the blue used for the eye slits, as they almost give off a glowing effect under the right lighting. 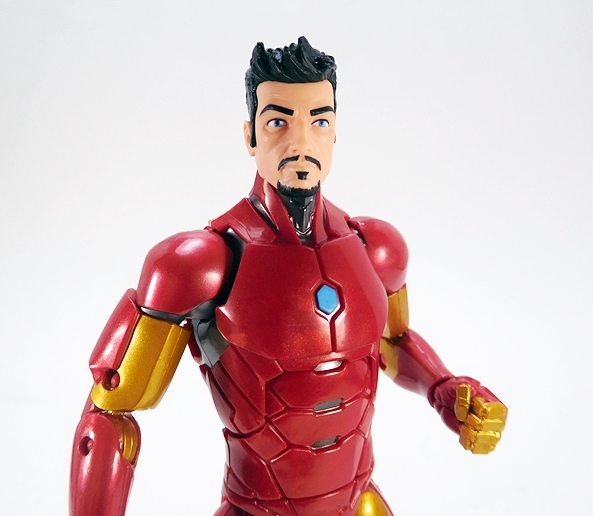 You also get a really cool comic-based Tony Stark head, which really sold me on this whole package. It’s a beautiful sculpt that borders a bit between comic and animated. 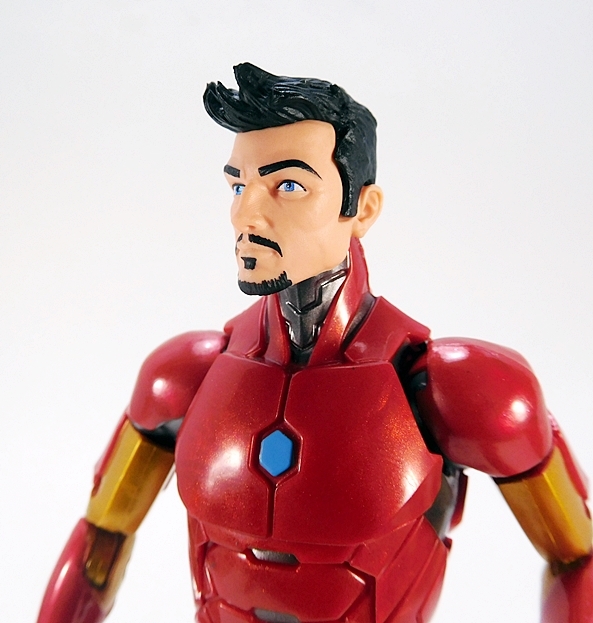 It’s got some pretty sharp paint and the sculpting for his hair is especially well done. Gotta dig that pompadour! 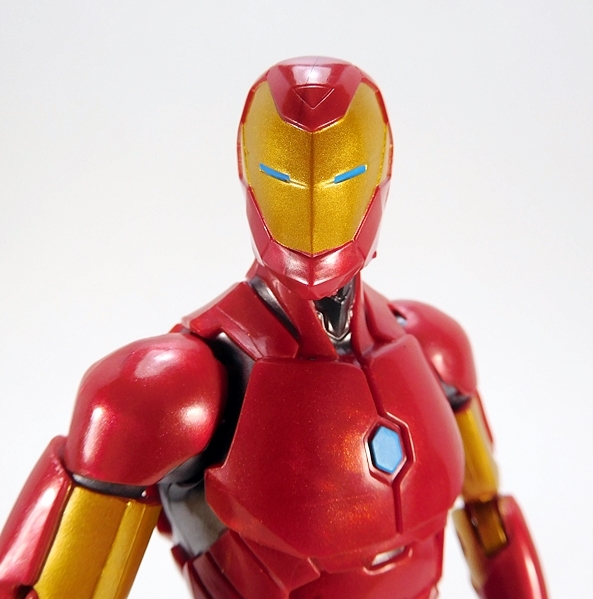 All in all, I think this noggin looks fantastic on the figure. 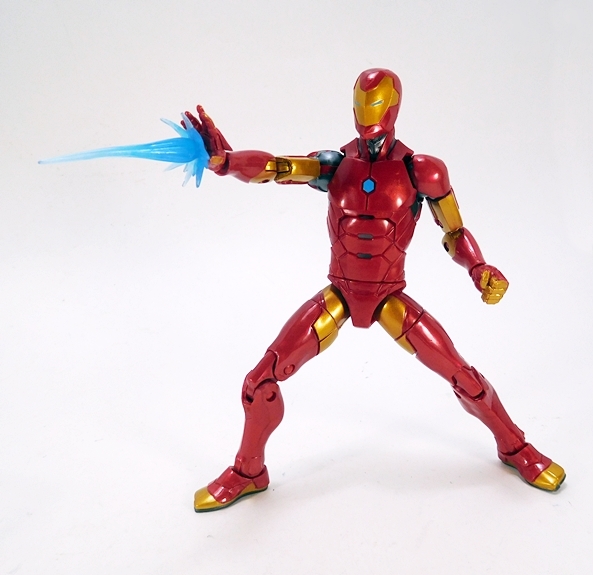 Iron Man comes with two sets of hands, and these include fists and the open hands for firing off his repulsor beams. 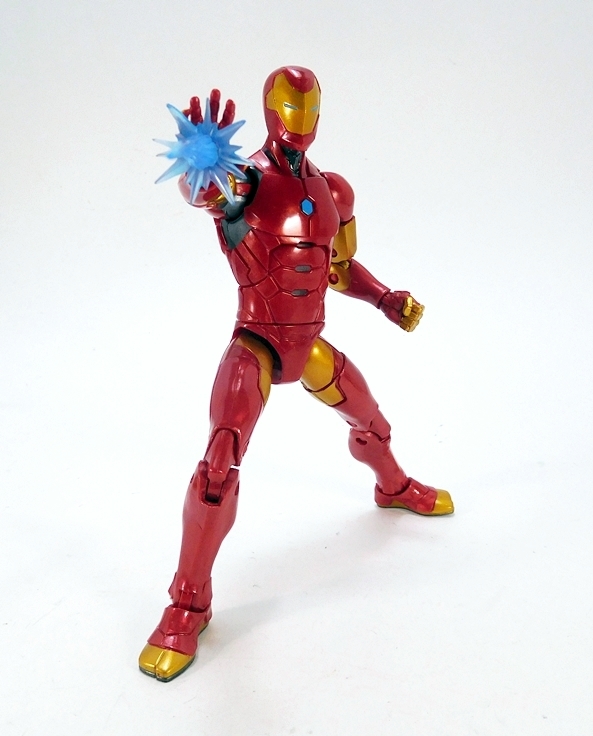 He also includes a set of blue blast effect parts, which can peg into the open hands. The effect parts work OK, but they do droop a little because they’re made of soft plastic and that ruins the effect a bit. 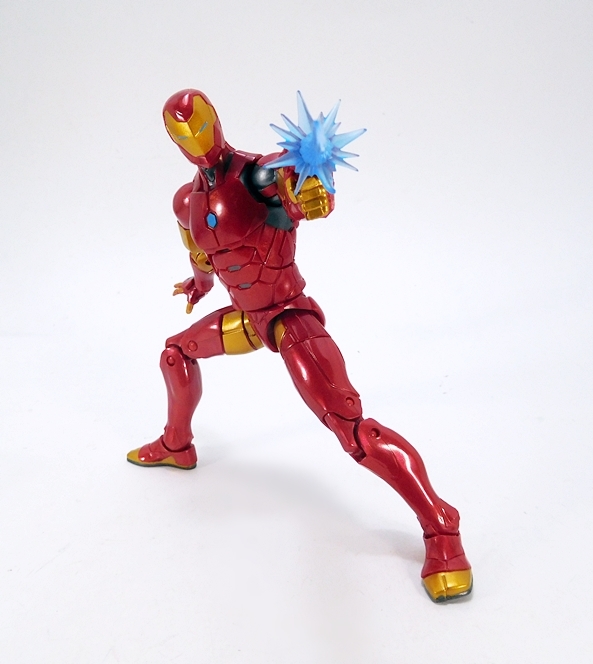 Lastly, you get this big cannon that clips onto either of Tony’s arms. 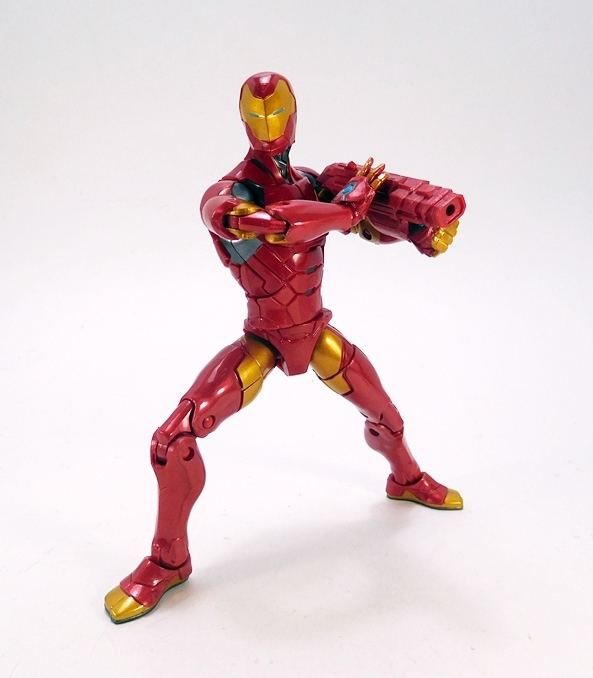 At first, I thought this thing looked like one of the goofy oversized missile launchers that Hasbro loves to pack in with their 4-inch figures, but I’m guessing it’s supposed to be something that deploys and retracts from the suit. I actually like this thing a lot and you can plug the effect part into the end of it as well. It’s pretty fun. I wasn’t really looking forward to it, but this figure turned out to be quite a nice surprise. I don’t think the armor design is going to be everyone’s cup of tea, but I’m happy to be getting some more comic-based armors, and while I wouldn’t want this to be an everyday look for Tony, I can get behind it for special outings. 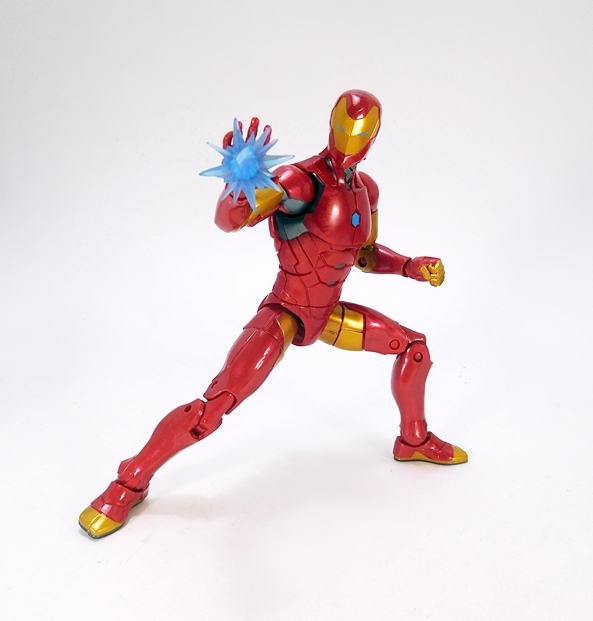 Granted, I’m a pretty easy sell when it comes to Marvel Legends. I’m probably as close to a completionist as you can get without actually being one, so it’s not like this one was a hard sell, but I’m definitely glad I picked it up. 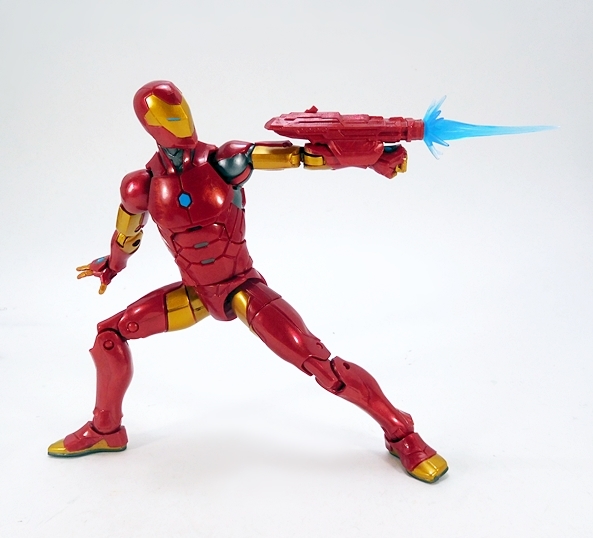 Come on back tonight and I’ll have a look at the Okoye Build-A-Figure!